The 91-year life of Joyce Pulk quietly was given back to the Lord on Saturday, July 7, 2018, at her residence at New Perspective Senior Living, in Prior Lake, MN. A Mass of Christian Burial will be held on Tuesday, July 10 at 11 am, with a visitation from 9-10:45 am, at St. Michael Catholic Church 16311 Duluth Avenue SE, Prior Lake, MN. Father Tom Walker will preside. Joyce’s pall bearers will be, David Pulk, Andrew Pulk, Mic Mraz, Alex Scott, Stew Pulk and Clint Pulk, with heaven’s honorary bearers of Dennis Pulk and Ryan Pulk. She will be laid to rest at Credit River Cemetery. The simple life of Joyce Clara began on October 28, 1926, in TrimBelle Township in Wisconsin. She was the youngest of six children born to Albert and Mary (Brickner) Deiss. Joyce grew up on the farm, in the area known as Big River near Ellsworth, WI, with siblings, Beatrice, Clarence, Marvin, Mildred and Virginia. She spent many years working hard on the farm, especially milking the cows by hand. Joyce attended Big River grade school. Upon entering Ellsworth High School, she boarded in town, while assisting families with household chores. Joyce completed her education in 11 years. 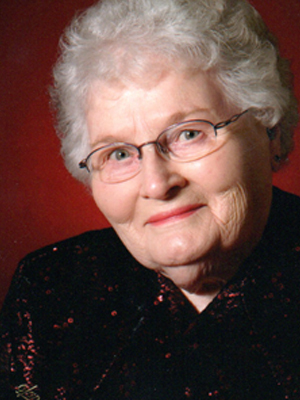 After graduating from high school, Joyce took a position at the Ellsworth Bank. She then set her eyes upon a hardworking and “fun guy” named, Stewart J. Pulk. They courted for a short time and on February 6, 1945, Joyce and Stewart married at St Joseph Catholic Church, in Prescott, WI. From this union, they welcomed eight children, Patricia, Michael, Peter, Joseph, Mary, William, Paula and Robert. She always knew her place was raising her children, taking care of her husband and the household. From morning to night, Joyce could be found in the kitchen baking and cooking meals. She had perfected over 100 recipes based on a pound of hamburger. Joyce would tend a large vegetable garden and put-up many servings of preserved fruits and vegetables. Their first home was nothing more than a converted chicken coop in Ellsworth, WI. Multiple moves to Litchfield, MN, Prescott WI and then to Hastings, MN before moving to Bloomington, MN in 1956. In the early 70’s, Joyce and Stewart moved to Prior Lake, MN building a home in Casey’s Addition. Shortly after, they purchased acreage in Credit River Township and built the family homestead. They loved to spend Saturday nights with friends and family polka dancing at the local halls. After the unexpected passing of Stewart in 1996, Joyce remained on the farm one more year, before moving into Prior Lake, where she remained. Joyce was a prolific and skilled seamstress and very handy with a crochet hook and embroidery needle. Her handiwork graces countless items that are cherished by many. She was a quiet, humble and self-sufficient woman, who enjoyed intimate conversations with family and friends. Joyce was interested in keeping up with the lives of her children, grandchildren and her great grandchildren. A bargain shopper, she felt the best when a coupon could sweeten the deal. Family and faith were most important to Joyce. She and Stewart were an excellent example of a committed marriage in good times and in bad. Joyce loved her family immensely and was very proud of each and every one of them. Her character of generosity, resourcefulness, reserve and love; was rooted in her strong faith in God. Forever loved and celebrated by children Pat (Tom) Weeklund, Mike (Karen) Pulk, Pete (Jill) Pulk, Joe (Julie) Pulk, Mary (Mike) Mraz, Bill (Denisa) Pulk, Bob (Shona) Pulk; son-in-law, Troy (Nancy) Scott; 23 grandchildren, 27 great-grandchildren; sisters, Mildred Ray, Virginia Reis; sister-in-law, Bernice Deiss; brother-in-law, Roger “Bud” Pulk; other relatives and friends. Joyce entered eternal life joining her loving husband, Stewart; daughter, Paula Scott; daughter-in-law, Paula Pulk; grandsons, Dennis Pulk, Ryan Pulk. Siblings, Beatrice (Marvin) Worth, Clarence (Mildred) Deiss, Marvin (Elvira) Deiss, brothers-in-law, Jim Ray and Herman Reis. My sincere & heartfelt condolences to each & everyone of JOYCE’s family. She was an amazing Lady. She was my dear friend for many years. I always said, “your my big , Sis”, Joyce! When our husbands Stu & Charlie passed away in 1996, just 2 months apart, we had many nights on the phone supporting one another. Thanks for the great memories, Sis! Love you! Until we meet again! Prayers & hugs to you, all! Jan Yetzer….